As higher education seeks to change and adapt, it is important to preserve its best aspects, said Ms. Keohane, who is president emerita of Duke University and Wellesley College, and a visiting professor at Princeton. Even more vital, said Ms. Keohane, is that access to higher education be broadly preserved. 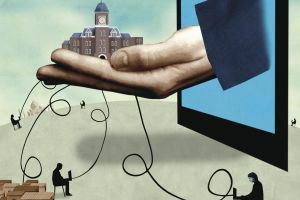 The worry, she said, is that online education and MOOCs will be relegated to the “less fortunate,” while the top 5 percent of the population will have the opportunity to attend places like Harvard or Princeton.